What can be done about the theft of a magical sword that doesn’t actually exist? Law professor Greg Lastowka explains. In the winter of 2005, a man named Qiu Chengwei accused his friend of stealing a prized possession, his sword. Chengwei appealed to the police in his home city of Shanghai. They refused to press charges. No real crime had occurred, police said, because the sword wasn’t real. Chengwei had won the sword in the virtual world Legend of Mir 3, through long hours of play. Later, he loaned the virtual object to his friend. It was just a flickering symbol on a screen, but the sword was worth real money. His friend sold it online for the equivalent of $871. Chengwei eventually broke into his friend’s house and stabbed him to death. He is now serving a life sentence in prison. In “Virtual Justice: The New Laws of Online Worlds,” Greg Lastowka argues that the legal system can no longer afford to ignore virtual worlds, places where people spend time, do real work, and earn real money. 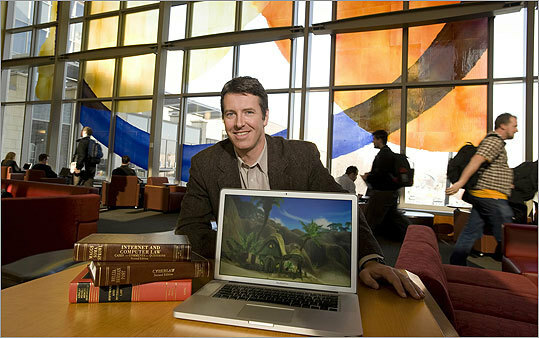 A longtime video game player himself, the Rutgers law professor got interested in virtual worlds when his two sons logged on. As he moved deeper into communities where cyber property theft, cheating, and even fraud were the norm, Lastowka began to wonder about legal implications. To enter a virtual world, gamers create a human-like figure called an avatar that they control on the screen. The avatar can talk to other avatars, earn virtual currency by slaying monsters, and buy virtual goods. But when virtual currencies are pegged to real money, how legal is it for one avatar to mug another and make off with his virtual gold coins, wondered Lastowka. If a gamer uses real money to buy or sell an item like a virtual sword, does he owe taxes? What if a platform owner shuts down a player’s account after his avatar makes controversial comments? His online goods, worth real money, will simply disappear. Is this a breach of First Amendment rights? The Shanghai murder is just one example of virtual life bleeding into real life, according to Lastowka. He recently consulted with police in New Jersey about the possibility that these online worlds, with their unregulated currencies, might become magnets for money launderers. He has met with lawmakers in Germany and South Korea, both countries with large groups of gamers. But Lastowka also worries that too much governmental oversight might ruin the worlds’ freewheeling fun — and with it the whole reason people visit them. Lastowka spoke to Ideas by phone from his home in Swarthmore, Pa.
IDEAS: The most concrete link between life in virtual and real worlds seems to be money. Can you explain how Second Life and some other worlds peg currency to ours? LASTOWKA: It’s not very different from points systems or frequent flyer miles. When you enter into a virtual world, you can acquire virtual currency that allows you to buy virtual property and services. You can acquire virtual currency with real money, and you can cash out virtual currency for real money....In some virtual worlds you need to acquire the virtual currency by working. IDEAS: How does that lead to “gold farming,” which you mention in the book? LASTOWKA: Gold farming is when people are playing a game like World of Warcraft and they are working at acquiring the virtual gold in order to sell it to another player....That player will transfer money through PayPal to the gold farmer. It’s a way of earning a living by working in a virtual world. Some virtual world owners prohibit this kind of activity and try to stop it, sometimes through lawsuits. Others encourage virtual economies and allow users to build businesses based around providing services and properties to other players. IDEAS: What about the player you call a “virtual Bernie Madoff”? What kind of world was he operating in? LASTOWKA: EVE Online is a virtual world that is based on a libertarian alternate universe dominated by ruthless corporations. Players in EVE Online are encouraged to defraud one another and to engage in things like corporate espionage that would be illegal offline. So, one player set up a bank for other players. Players started to invest because the bank promised a high rate of return. And at first he was actually paying out this return, so more and more players got interested in investing in his bank. In EVE Online, players can exchange real money for the virtual currency. Some players changed real money into virtual currency, invested in the bank, got their returns, and converted them back into real money. In many ways it was operating like a real bank. After he had acquired the equivalent of $100,000 in virtual currency, the player who had started the bank revealed to everyone that he was in fact a pirate and the bank was a scam. Essentially, it was a Ponzi scheme. LASTOWKA: The owners of the virtual world, even though they prohibited Ponzi schemes in their terms of service, said that this was not a violation of the game’s rules and they didn’t plan on taking any action against the virtual Madoff. The legal question is whether or not this should be viewed as a real-life fraud. This depends on whether you believe a virtual world can set up its own rules with regard to fraud that will be binding on its users, or whether a Ponzi scheme in a virtual world that defrauds players of virtual currency is just as criminal as a Ponzi scheme in the real world. IDEAS: In real life if you assaulted me with a gun, I would take you to court. But in World of Warcraft that is just part of the game. LASTOWKA: Right. What’s interesting is the slippage between the desire to live a different life, to be able to do things you can’t do in the real world and to engage in violent or duplicitous behavior, and the fact that you are acting this way in functioning online communities with their own economies. IDEAS: You argue that existing laws are inadequate to deal with the problems raised by virtual worlds. What kind of new laws would you suggest? LASTOWKA: We’re at a crossroads. I definitely think the current laws are inadequate. With regard to contract law and property law and copyright law, virtual worlds challenge the existing legal categories. Courts are grappling with the right way to apply existing laws to virtual worlds. The trend is toward turning virtual worlds into their own jurisdictions....The way that virtual worlds are structured is that the owners of the platforms have the ability to exclude and expel voices that they don’t agree with. They have almost complete control over these environments due to the way that the law is structured and due to their technological powers over the environment. IDEAS: If the government starts taxing virtual goods, will these worlds just shut down? LASTOWKA: The owners would have to engage in elaborate accounting procedures that they don’t want to do. They need some leeway to be able to run their own economies and provide users with virtual property interests that are not treated the same as traditional offline property interests. IDEAS: Are there any historical antecedents? You talk about aviation safety laws in the book. LASTOWKA: That is just one example of government grappling with a new technology where it is clear they have to ensure people’s safety. The best antecedent, which is also part of the question, is the Internet....There are special laws about identity theft. There are special laws about hacking. But we’ve developed most of this jurisprudence, common law, and doctrine just in the last 20 years. But we don’t have any of this that is specifically pertinent to virtual worlds, at least not in the US. In South Korea there are some laws, and we’re getting some cases developing here. Rachel Nolan has written for The New York Times, Forward, and The San Francisco Chronicle, among other publications.